We've just launched The Delicious One Signature Edition, so we don't have too many reviews yet. But here is the first feedback, printed here with permission: highlights followed by full reviews. It’s not just delicious, it’s scrumptious. The more resolving and detailed your system is, the more you need The Delicious One for poorly recorded source material. It has become an integral part of my system and has greatly exceeded my expectations. It has helped me rediscover many CDs that used to be ‘car only’ music. The Delicious One is completely transparent when in bypass ... It is dead quiet as well. I couldn't be happier with the Delicious One. It works like a charm. By making adjustments to the big knob on The Delicious One it is easy to fine tune the sound and calm an otherwise bright recording. The Delicious One is just what the doctor ordered! With a slight adjustment of the big knob I was able to dial out the brightness and I do not notice anything negative, only great sound! The Delicious One improved my enjoyment of [harsh/thin/fatiguing recordings] immensely. A wonderful external tone control that definitely has a place in a high-end system to enhance low volume listening enjoyment. Once you have The Delicious One installed in your system you will quickly realize its benefits. This premium quality external tone shaping tool will provide me with many hours of improved listening pleasure when I need to tweak a less than perfect recording or when I am listening at low levels and want loudness compensation added. Tone shaping doesn’t get any simpler. The Delicious One is a keeper. With The Delicious One, my preamp options have opened up. 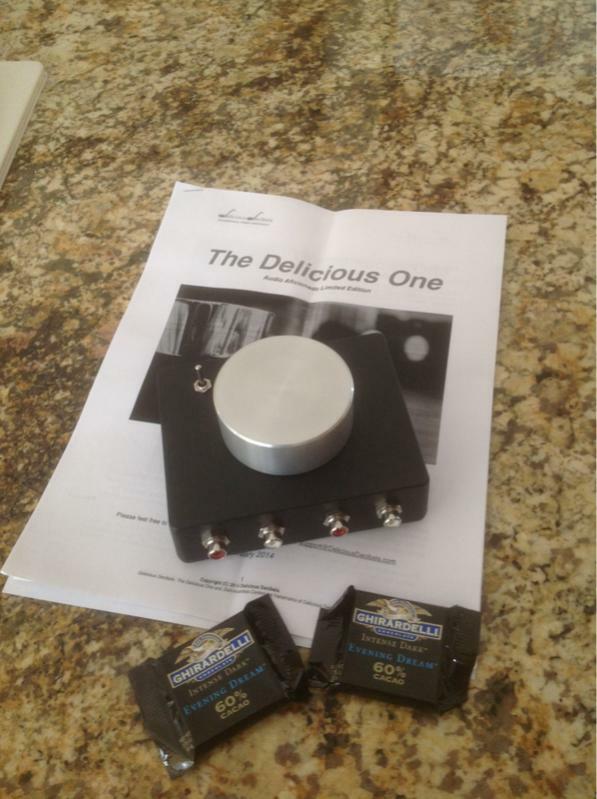 The Delicious One is a very cool addition to any sound system, especially those without tone controls. In my system I prefer The Delicious One to built-in tone controls for some recordings. 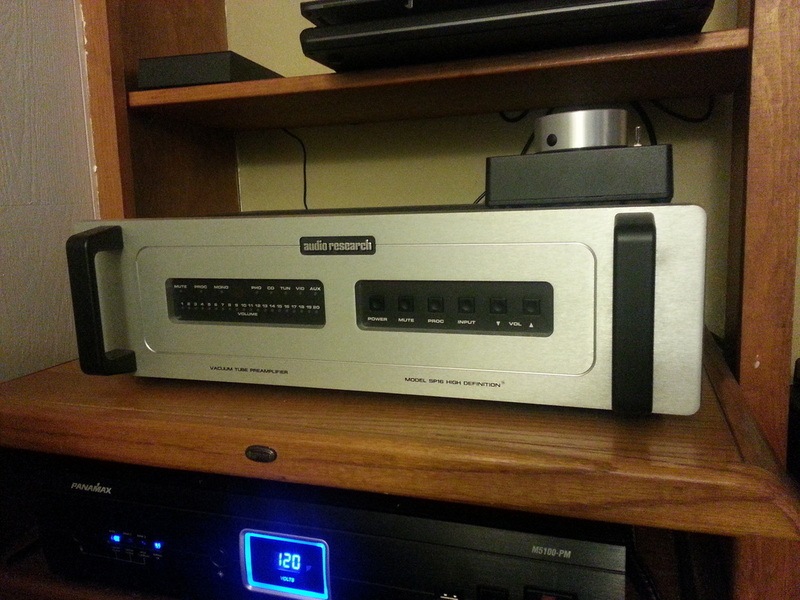 It is remarkably well made, surprisingly heavy, and really feels like a quality component. The Delicious one is built to impress. A great product and first-rate communication throughout every step in the process. The physical design is unique in size, weight, and control function. My impression of the physical shape and size is very positive. The quality of the input and output RCA connectors is excellent. The Delicious One is a carefully hand crafted audio component built using high quality parts. You sense the quality and pride it was built with the moment you lift it. It is heavy for its size and solid as a brick. 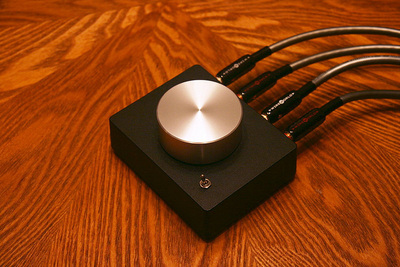 The big knob control operates as smooth as silk. Some of the images sent by happy customers. Click on image for full size. 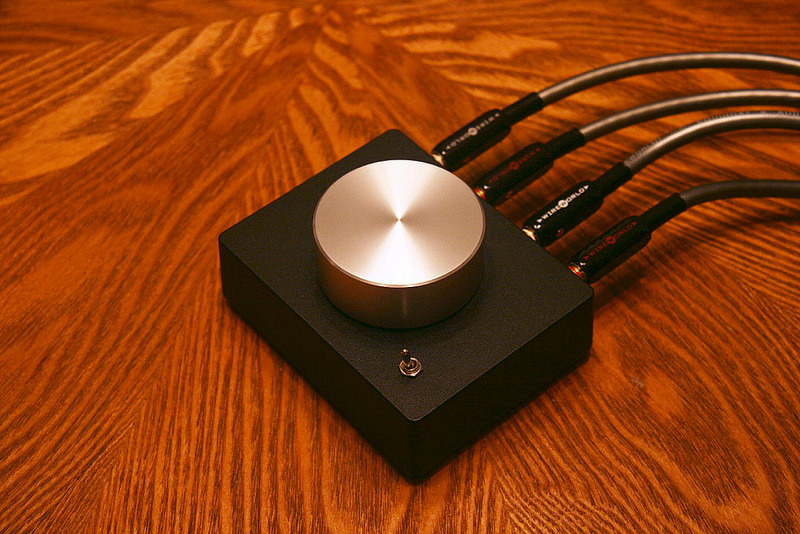 The Delicious One in a Zen-like minimalist system ... 'cause sometimes you want some tone controls. Dan's Delicious One connected with WireWorld cables – NICE! The Delicious One with the stunning Shindo Lafon SET monoblock. Too much of a good thing? The Delicious One with a classic Audio Research Preamplifier. Single-ended triodes can sound even more delicious. The Delicious One looks great and color-coordinates with Jim L.'s system. Read a thorough review on Audio Aficionado. "I'm extremely pleased with my Delicious One. It does everything I was expecting and then some. It’s not just delicious, it’s scrumptious. I really like the feel of the knob. It’s got just the right amount of resistance and lets the user know it’s a high quality device. Well done. I’ve been looking for a device like this to facilitate a move to a no-frills tube preamp, e.g. Shindo. 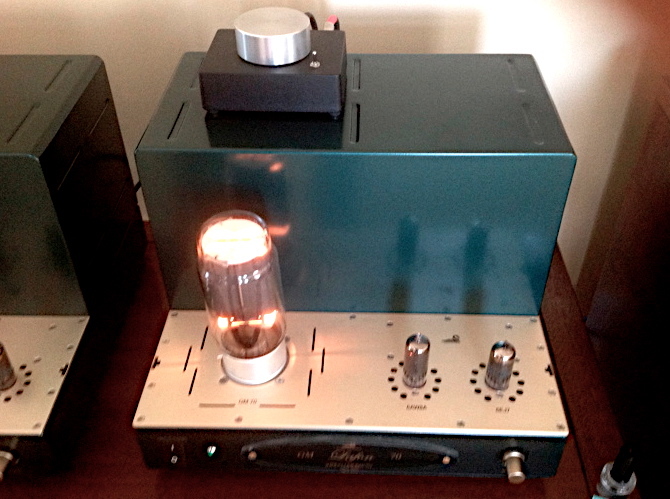 I have been reluctant to make the transition because I like to make liberal use of the tone controls on my Mc C48 preamp. With The Delicious One, my preamp options have opened up. I’m excited about the future. I’ve found that with my older rock recordings from the 70’s and 80’s, e.g. Boston, Firehouse that the Delicious One sounds superior to the others. I wasn’t expecting that since the C48 five band EQ should theoretically be better. But in my system I prefer The Delicious One for those types of recordings. I plan to leave it set up this way and just toggle between the inputs based on my mood and the type of recording. It’s great to have choices! Thanks for providing a great product and first-rate communication throughout every step in the process." It’s still as delicious today as the day it arrived. It has become an integral part of my system and has greatly exceeded my expectations. It has helped me rediscover many CDs that used to be ‘car only’ music. My current setup has it in between my source and preamp although I’ve experimented with it between the preamp and power amp. For convenience reasons, I like it better between the source and preamp in my system. Thanks from a super-satisfied customer. "Installed #2 in one of my systems today… LOVE IT!!! I received my Delicious One. This is the first time I have seen it in person. It is remarkably well made, surprisingly heavy, and really feels like a quality component. Alberto... thank you for creating such a wonderful device. The Delicious One arrived today and I installed in my system. Initially I put on a Dave Mason album I really like but it is too bright. "1st Alberto is awesome to talk to as well as extremely helpful. Everyone has a unique situation and I am no different. I missed having some type of audio control for poor recordings as well as my huge speakers in a small room issue. The Delicious one not only makes poor recordings sound better, it has also helped me overcome my room issues! This product does not introduce any noise in your system. Noise was one of the reasons why I had stopped using external equalizers. And when using it or dialing in the sound you want, I never once felt like something was missing. 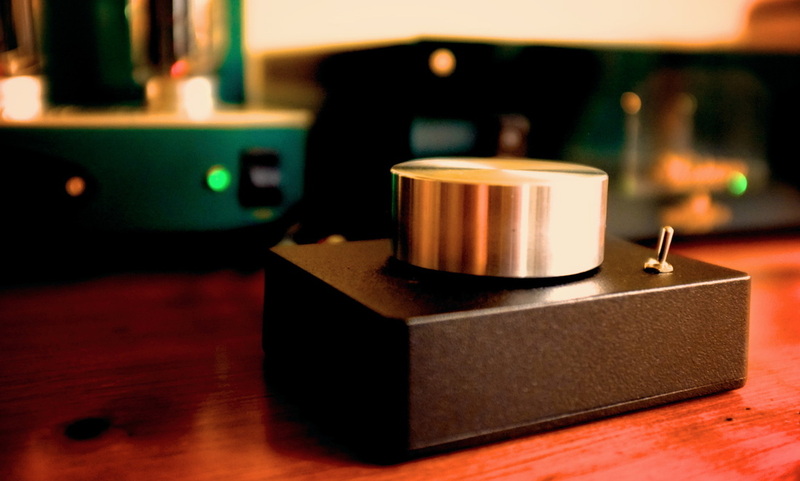 Having the large knob is perfect for slight adjustments instead of all or nothing types. I also want to thank Alberto for talking to me on the phone and helping me understand how exactly it works. Even though I like my Audio Research SP16 preamp, I wanted some type of compensation for my room and bad recordings and was about to pull the trigger on a McIntosh C3200. The Delicious One not only helped me solve my wants but saved me a lot of $! Once you understand how it works, how it doesn't bring any noise into the chain, and basically get the hang of it, you won't want to go on without one in the chain. Late night listening in my townhome is also way more pleasing with this unit! I do not have to have the volume up so high to "pressurize" the room to get things to sound right. At lower volumes I am not wanting more. Meatloaf the entire "Bat Out of Hell" LP or CD, great music but horrible recording. Led Zeppelin "When the Levee Breaks" isn't so piercing with the Delicious One. I have a lot more to type out but I will do it at a later time. Alberto, thank you again! This is a well built and extremely useful product." Another cd / LP the delicious one helped make better. Billy Joel 52nd street. This is one of my fav LP from Billy. Zanzibar, Stiletto, Rosalinda Eyes, all need some bass and its a little thin. Thanks again for the delicious one for making one of my favorite Billy Joel albums better. "Here are my initial impressions of The Delicious One. The physical design is unique in size, weight, and control function. The dimensions allow an end user to easily adapt the loudness control into a sound system without requiring a rack shelf. 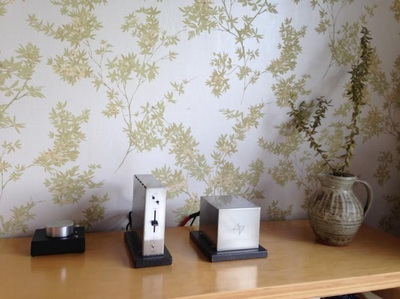 It can be placed near a preamplifier on the same shelf or hidden from view entirely. My impression of the physical shape and size is very positive. The weight is just right and allows the enclosure to stay put while adjusting the knob or bypass switch. The quality of the input and output RCA connectors is excellent. The control knob is a perfect size that allows an adult hand something substantial to grasp while making adjustments to the loudness contour. The large size of the control knob also makes it easy to make small adjustments without overshot. I like that. Overall I believe you have created a wonderful external tone control that definitely has a place in a high-end system to enhance low volume listening enjoyment."